With Fall right around the corner, I thought I would go ahead and dust off my sewing machine in preparation for some new projects. I've been wanting to check out Whipstitch at their (relatively) new digs on the Westside. I walked in with no ideas and little inspiration for my next project. To my surprise, wild inspiration came rushing through me the moment I laid eyes on all the delicious materials. Whipstitch has an amazing selection of chic, playful, stunning and down right adorable material. The inspiration was so intense, I was overwhelmed. After spending over an hour in the hip Marietta Street storefront, I headed home armed with a new sewing book, written by Deborah Moebes, and some beautiful materials for my next project. 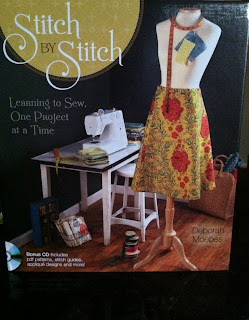 Deborah's book, Stitch By Stitch, was written for the new and returning stitcher and from what I can tell, it's a great refresher--no matter your level of sewing experience. Definitely worth checking out! If you are looking for truly different, yet quality materials and notions, check out Whipstitch in West Midtown Atlanta. You will not be disappointed!